While these iconic images can create beautiful and meaningful cards, sometimes you want something a little different. You want a card that fits your personality or sense of style and won't blend in with dozens of other cards. With the right design, your card can stand out while still offering a religious message. While you can spend hours looking through the racks at your local card shop to find the perfect design, the best selection of unique Christmas cards can be found online. 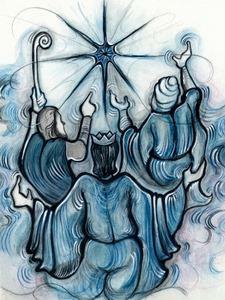 In addition to Christmas wishes, the cards also include narratives explaining the history of the artwork. Christmas Crown - This design features a pine tree topped with a crown of thorns. If your search for unique religious Christmas cards leaves you without the perfect design, try making your own. You can use a card-making computer program like the Art Explosion Christian Greeting Card Factory or call on your crafting skills. When you customize the artwork, message, and layout, you create the ultimate unique card.